Several commercial fishermen (and one journalist) put on thick neoprene survival suits and jumped into the water simulating an abandon ship emergency. 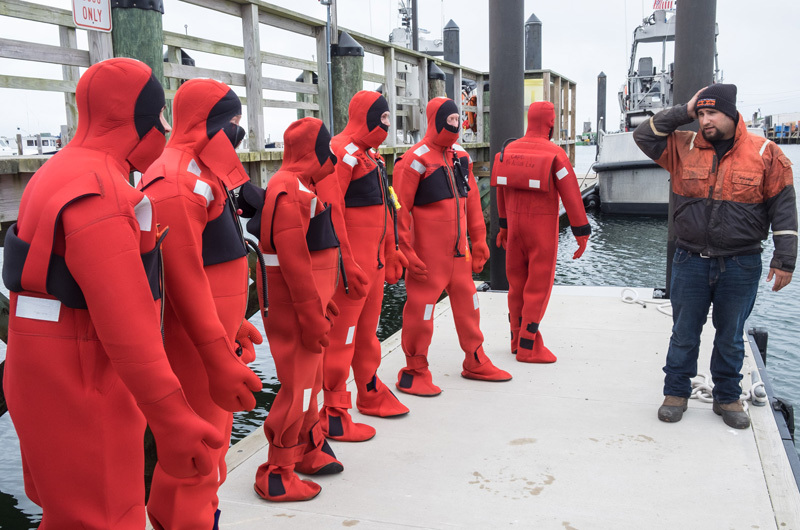 Sitting on the concrete floor of the Menemsha coast guard station, seven commercial fishermen (and one journalist) stuffed their feet down into Gumby suits, a nickname for thick neoprene survival suits. Some had suited up before­ - one for a real emergency, but most only to try the suit on. But on a dreary Thursday morning, they were all going to plunge into the ocean as if abandoning ship in an emergency. 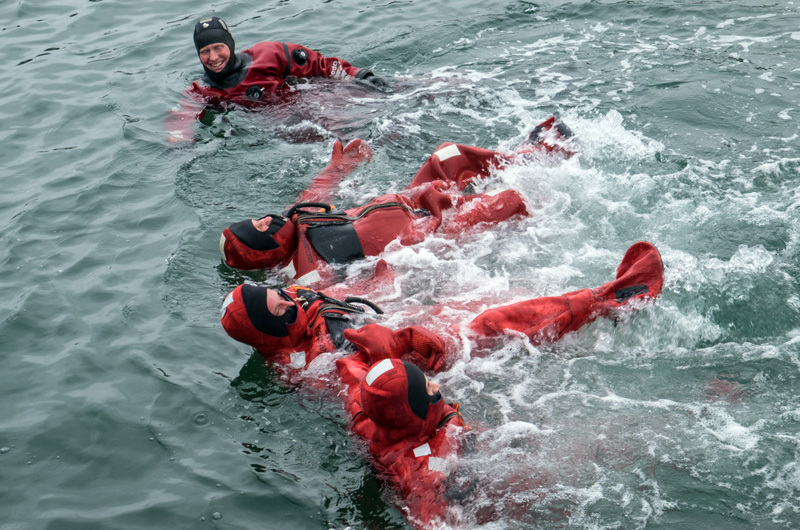 The group was taking part in a Safety and Survival Training program, a two-day free course that walked commercial fishermen through live saving skills from the basics of splinting broken bones, cleaning cuts and burns, to igniting flares, responding to fire and leaks, and donning survival suits and plunging into the frigid water. Developed in 2005 after a series of deaths at sea near New Bedford, the safety training program has traveled the coast. Director and retired coast guard captain Ed Dennehy recalled one incident in particular. A scalloping boat called Northern Edge sunk off New Bedford and five of the six people aboard died. The lone survivor was the only one who was able to get into a survival suit. He had done some safety training in Portugal before coming to the United States. Through grants, the current program was developed. Fishing Partnership Support Services now sponsors the training. Vineyard fishermen know only too well how dangerous their occupation can be. Last summer, commercial conch fisherman Luke Gurney died in a fishing accident. The loss to the Island community and fishing community was profound. 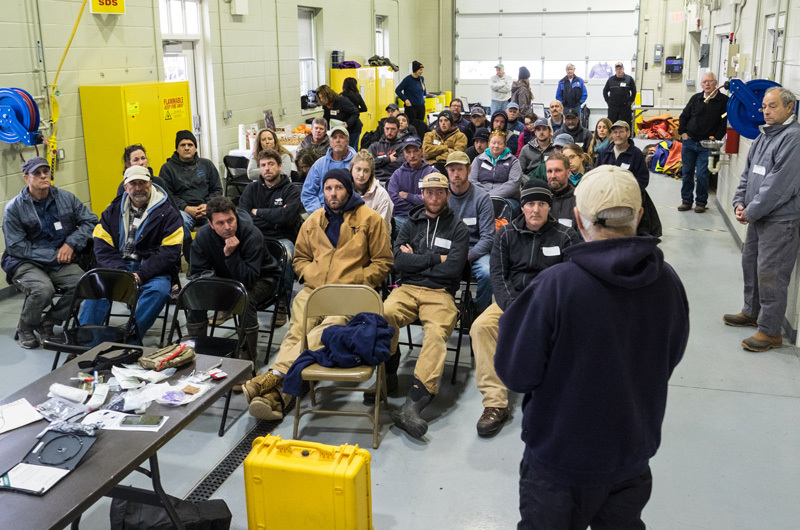 Safety training aims to give fishermen tools to navigate emergencies. Some Island fishermen have attended safety training in New Bedford and Chatham, but the program had never been hosted on the Vineyard. Through a joint effort of the Martha's Vineyard Fishermen’s Preservation Trust and Fishing Partnership Support Services, the program was brought to the Island and hosted at the Menemsha Coast Guard station. About 35 fishermen attended on Thursday, including a shellfish constable, harbor masters and charter captains. On Friday, captains could complete their drill commander certification. Boats that travel outside three nautical miles are federally required to run four drills (man overboard, fire, damage control and abandon ship) on a monthly basis. A lot of the hands-on training on Thursday focused on familiarizing the fishermen with the safety gear. Mark Bisnette and Matthew Pawlishen, marine surveyors and safety consultants, rolled out a number of survival suits as examples. They explained how a monthly one-minute check of the suit can be just as vital as having a suit on board. In an emergency, knowing your suit is properly stored and in working order can make all the difference. “This stuff happens very quickly. Make sure you cut out that extra time,” said Mr. Pawlishen. The men discussed different survival suits on the market, but reminded the fishermen it came down to what was on the boat. Stepping into the water, the fishermen bobbed up and down like corks, unsinkable in the thick red suits. Laying back in the water, they paddled clumsily with their hands to link together before heading out as a group to the round floating raft. Through a team effort, everyone was safely piled inside the raft, still dry inside the suits but a bit out of breath. Feeling comfortable navigating in a survival suit will reduce one more stress during an emergency. 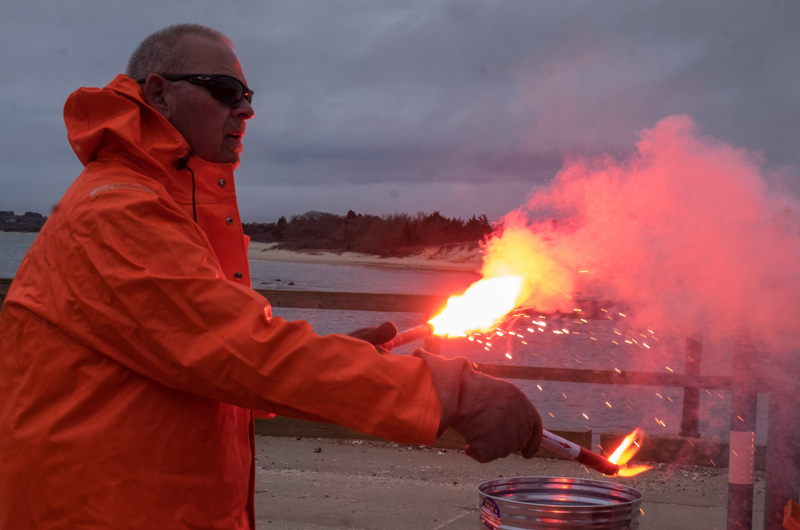 Safe and dry on land, other fishermen practiced lighting flares, yanking out strings with limited dexterity, their fingers encased in thick gloves to simulate emergency conditions to protect the hands. Billowing orange sulfur-smelling smoke poured from can shaped flares, while fire crackled from the end of wand-shaped flares. While knowing how to ignite a flare is paramount, many fishermen have not had any practice. “It’s costly for fishermen to light off flares,” said Mr. Catala. Fishing Partnership Support Services collects expired flares from fishermen to use as practice tools in their training. Matthew Mayhew, a commercial fishermen who’s worked dragging and oystering, said that before this training, he’d only run routine drills with his dad. Fishing Partnership Support Services also provides health care, dental clinics and general support for commercial fishermen. Vice president, Andra Athos said traditionally, only 10 per cent of the fleet is trained in safety. She said the group hopes to bring the program back to the Vineyard annually.